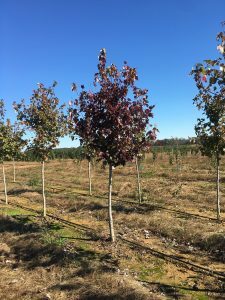 Photographs of Products – Lacroix Nursery, Inc.
One of the oldest of the Red Maple cultivars, is well adapted to the eastern and southeastern U.S. Nice Fall color and adapts well to moist or poorly drained soil. 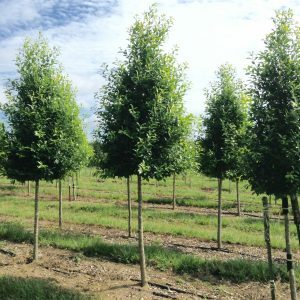 Small, deciduous trees grown for their graceful habit, autumn color and beautiful foliage which may be colored or deeply dissected. 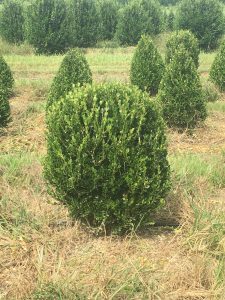 Tough, durable, compact evergreen shrub. 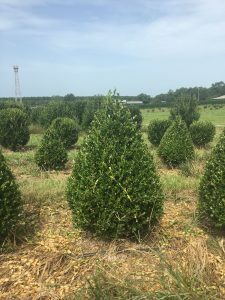 More cold tolerant than Japanese Boxwood with a more upright growing habit. 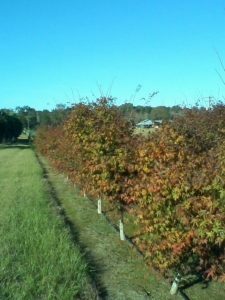 Excellent choice for small hedges. A very profuse bloomer, yielding a showy pink, single bloom flower. 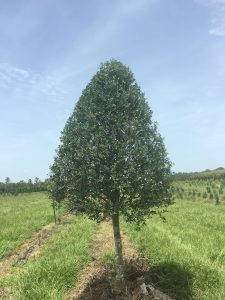 Very durable, this glossy, dark green evergreen makes for a great large screening hedge, as well as a wonderful specimen in a multi-cane tree-form application, displaying a broad “umbrella” canopy. 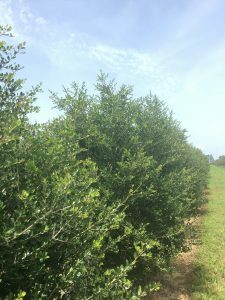 Best used as a hedge or large screen, this glossy, dark green holly grows as wide as it does tall. 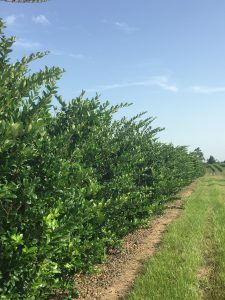 A very profuse berry producer, this fine textured leaf holly flushes evenly, allowing for less trimming in informal applications, or it can be trimmed tightly to yield a formal hedge or specimen. Dense pyramidal, glossy dark green leaf holly similar in growth habit and appearance to the ‘Nellie R Stevens,’ with the exception of a larger flat-shaped leaf. Recognized by its “serrated” leaf margins, this unique glossy, dark green holly maintains a very pyramidal shape along with its bright red berries in the fall. 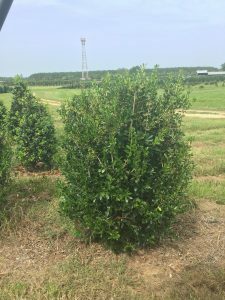 Upright growing holly that can be distinguished from the ‘Savannah’ Holly by its smoother leaf margins, lighter berry set and broader growth habit. 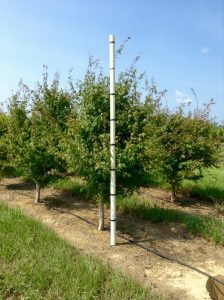 Makes a great street tree, screen, or specimen around pools or fountains where berries may not be desirable. This opaca hybrid has a small, flat, and slightly darker green leaf than other opaca species, typically with one tooth at the tip of the leaf, yielding a much softer texture. An upright pyramidal tree, makes a great selection as specimen or screen. 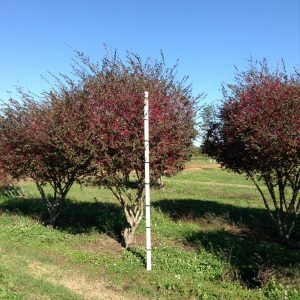 Upright, conical growth habit with a softer texture and light green color combined with bright red berries to provide an excellent specimen, or limited space, screening application. 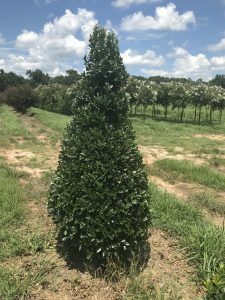 Most popular large pyramidal evergreen with light green foliage and heavy berry set. Pyramidal evergreen with light green foliage and heavy berry set. Performs well in alkaline soils. 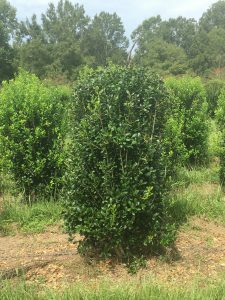 One of the most popular pyramidal, dark green, hollies used in the southeast. An excellent choice for screening or specimen. 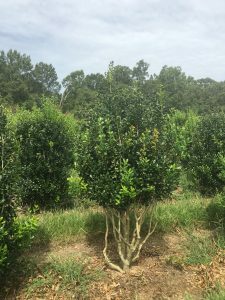 A tough, durable, fine textured holly native to the southeast ranging from Florida to Oklahoma, the Yaupon can be used in a variety of soil types and climates and will thrive in sun or shade. A National Arboretum hybrid, high in mildew resistance, broad and tall with some exfoliating bark. 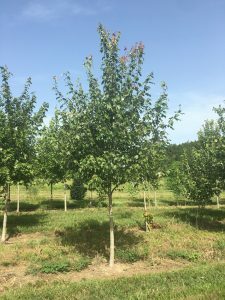 Best known for its profound exfoliating bark and copper tan trunk, underneath a snow white flower, this National Arboretum hybrid makes a tall, broad tree, high in mildew resistance. 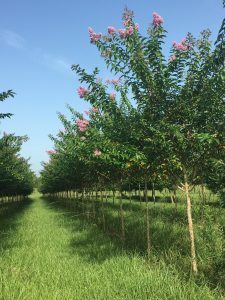 A more upright, broad vase shape Crape Myrtle, yielding a dark pink to light red bloom. 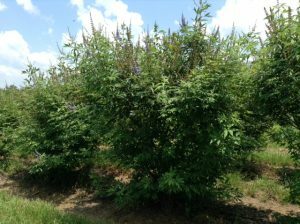 Another National Arboretum hybrid selection high in mildew resistance. Fast growing broad evergreen. 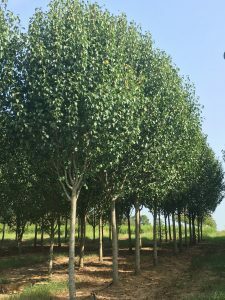 Leaves are glossy dark green and it is used for screening, as well as beautiful specimen tree-form applications. A “must see to believe,” LaCroix Nursery, Inc. has been perfecting the cultural practices necessary to produce this spectacular specimen since 1997. 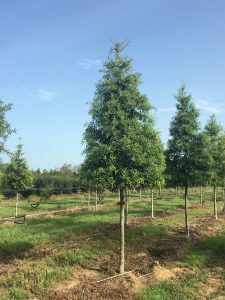 When grown in our southeastern sandy-clay loam soil to produce adequate caliper, and trained and pruned at the proper time, the result is an extraordinary, “umbrella” type evergreen canopy resting on a multi-trunk pedestal that can only be described as “breathtaking” when in bloom. 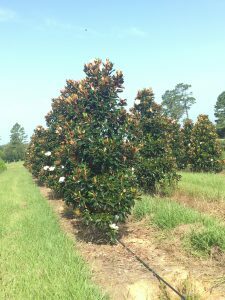 Fast growing, large brown-back leaf, pyramidal shape with a strong central leader. 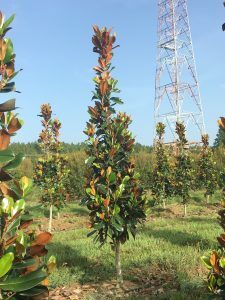 Slow growing, dark green, brown back cultivar. Profuse bloomer. 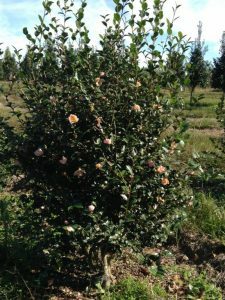 An attractive and useful small evergreen tree or large shrub with an open, loose crown. 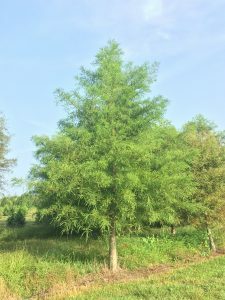 Native to sandy swamp lands and acid, wet, poorly drained soils throughout the southern states, this plant type has an attractive bark and tends to develop multiple trunks. 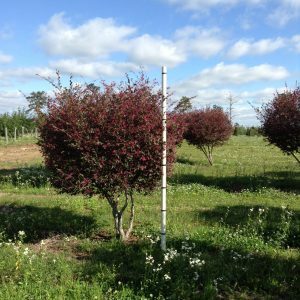 Native to China, this oval-shaped medium sized tree, is most known for its Fall color and showy white blooms in early Spring. 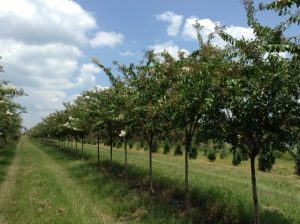 A Bradford Pear with a slightly smaller leaf and selected for its exceptional color in the fall. 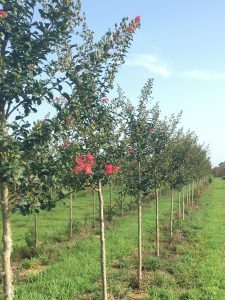 Vigorous, pyramidal growth habit, this Red Oak has excellent Fall color. 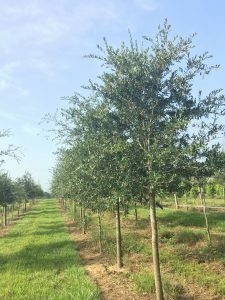 Mistaken for Shumard Oak, this oak performs best in a slightly acid soil. 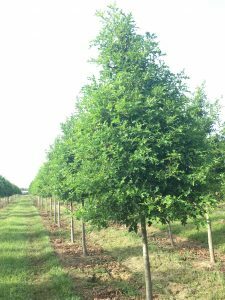 Native to the eastern and southeastern U.S., this upright, fine textured oak is an excellent choice as a street or fast-growing shade tree. 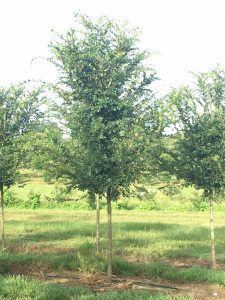 Popular broad canopy, known for its strength and longevity, a “must have” as a shade tree in the south. A deciduous conifer, displays a soft texture through its light green foliage in a cone-shaped form, contrasted against a soft, reddish-brown bark. Broad pyramidal conifer which makes an excellent screen. 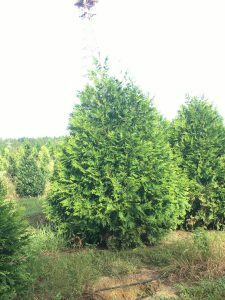 Good substitute for Leyland Cypress. Evergreen Palm with dark green, fan-shaped leaves, and a trunk that appears to have a furry-like texture. 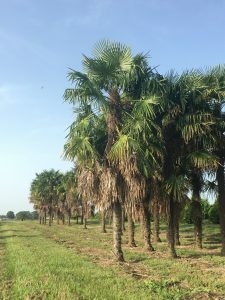 The Windmill palm is considered to be one of the most “cold hardy” palms and is an excellent choice for a framing tree, accent, specimen or patio planting. A Chinese elm cultivar, this species is noted for its superior dark green foliage and its exfoliating bark coupled with a fast-growing, broad canopy. Beautiful small multi-stemmed shrub with dark blue flowers and medium green foliage that bloom throughout the summer. Exhibits good drought tolerance once established.